Well, the teashop continues to be so busy that they’ve had to call in reinforcements. Only for washing up duties and other such unskilled labour, but you know me, I’m always willing to do my bit. One thing that was really nice to see too this week was when we had visitors come for lunch, but these weren’t locals, they were over from the US and after doing London, they wanted to experience some good old Yorkshire hospitality. After getting picked up at York railway station, their hosts Pat and David promptly made their way to the ‘Ginger Cow’ for lunch. Hopefully they left with their expectations met and I’m sure some tasty treats too. At the moment I have a little bit of a dilemma, which in truth has been running for some time now. As you know we have two llamas, who we named Miguel and Marguerita (Marj). They currently have Mac the ram living with them and that relationship is working fine, thank goodness. 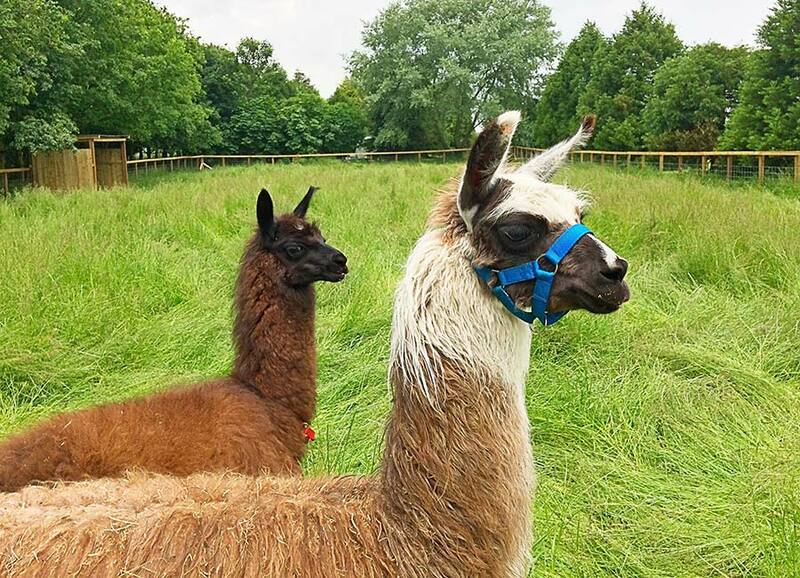 Now the thing is, I’ve been trying to get close to the llamas for months, not just for a cuddle, but to better care for them, but so far without success. Somehow I need to get a head collar onto Marj and adjust Miguel’s collar too. Before coming here they hadn’t had any real contact with people. They were in a shed with other llamas and alpacas and were very nervous. Over some weeks I got them feeding out of my hand and, as they are very inquisitive, they always come and see you when you walk by their paddock, but it’s when you try to stroke them or make any physical contact with them that you have the problem. With the help of my Dad, I have put my extensive joinery skills to use, and built a small pen inside their enclosure, in order to get them into a smaller more manageable space to work with, but that pen is now being increased in height, as they both tried to leap over the sides and I don’t want them to hurt themselves. My latest thought is to find a llama trainer locally who may be able to help me out or at least offer advice. They are such beautiful animals and I’m keen to have them tamed, for their sake and for mine – I’m only a little fella. We’ve been getting entertained this week by one of our feathered friends, a young rook. It appears that he took the leap out of the nest at the top of one of the pine trees, but only after leaping did he realise his wings weren’t quite ready for flying. Since hitting the ground, his parents have been patiently following him around making sure he’s been properly fed and watered. He has been merrily hopping around the farm, becoming acquainted with many of our animals and generally checking out these new surroundings at ground level, until his wings are strong enough for him to get airborne. I’m not sure where ‘Reg’ gets his head down at night, but we do have to keep our eyes peeled for Mr Fox. We wouldn’t want our little feathered friend to become his supper.